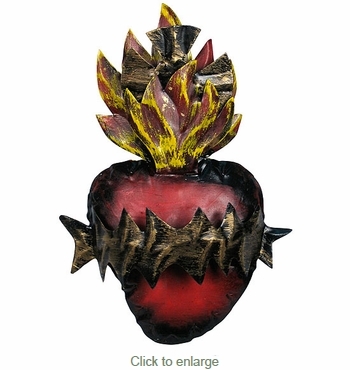 This sacred heart burning crown decoration is a wonderful religious folk art accent for your southwest décor. These vintage style tin folk art pieces are all handcrafted in Mexico. This beautiful hand painted heart on tin can be displayed in a traditional home altar, or given as a special gift.